We arrived in London, and the first day we got to know our neighborhood, grabbed food from the grocery store (we stayed at an AirBnB with a full kitchen – number 1 travel tip for families!!!) and recovered from flying. The next day, we set off to explore! 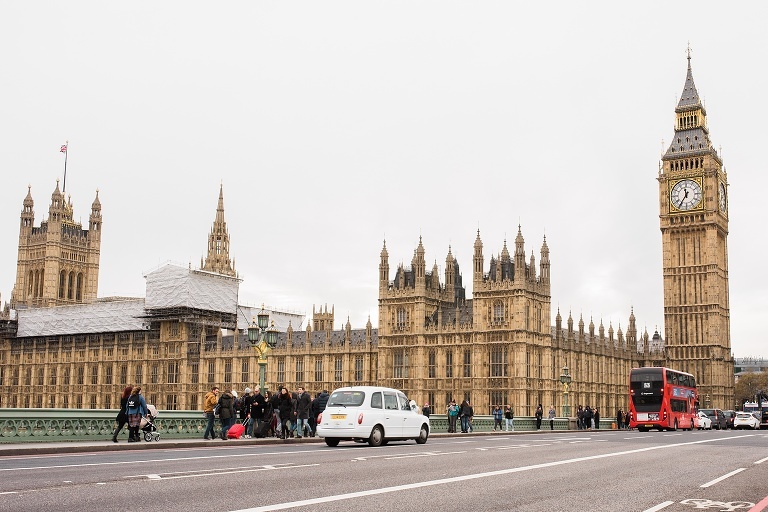 And of course, what better way to start than by taking an iconic London double decker bus to Trafalgar Square to view Big Ben! Our first full day in London was spent walking around St. James park, to Buckingham Palace, back down to Parliament & Westminster Abbey, across to the London Eye, we had lunch at a local restaurant near Waterloo station, then we took the train towards London Bridge. It was a LONG day with a lot of walking! Gus thought the red telephone boxes were pretty exciting and wanted a photo at each one! We timed it just right to see the Horse Guard’s Parade! Soren wasn’t super thrilled, and we didn’t stay very long. While many people recommended either the changing of the guard at Buckingham Palace or the Horse Guard’s Parade, I think for us, we weren’t missing much by skipping the former entirely and short-changing the latter. Looking back across St. James park towards the London Eye. 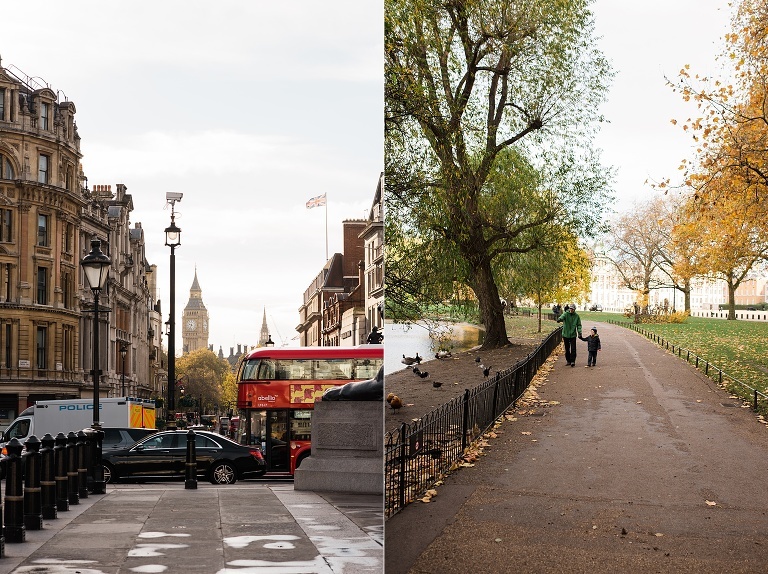 The weather in London was similar to fall in Iowa – cold, blustery, and wet! 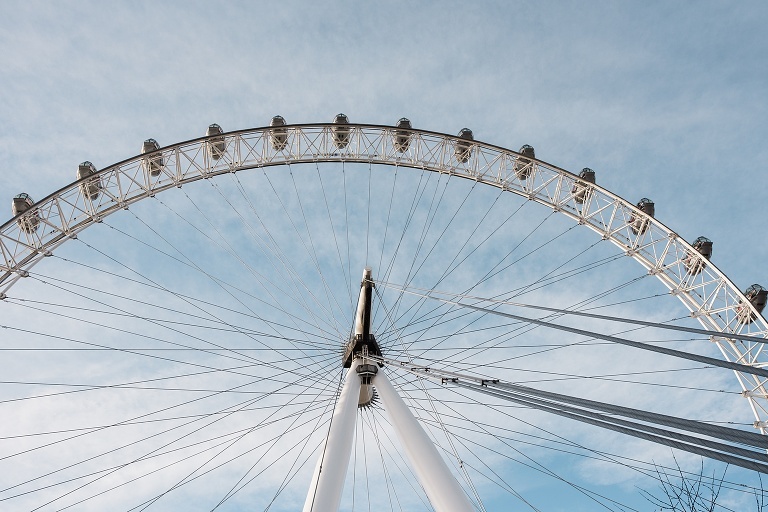 There are so many amazing places in London to visit – we had a hard time choosing! With limited time, and two small kids, we didn’t want to get in over our heads with too many sights. After a LOT of discussion, one place we thought would be worthwhile to visit, but perhaps a bit risky for our nearly-4-year-old’s attention span, was Westminster Abbey. While obviously known for hosting royal weddings and coronations, Westminster Abbey is also the burial sight for many monarchs, historical figures, and literary figures in Britain. We spent about 2 hours touring the Abbey. The audio guide was great! Bonus tip for those with younger kids – bring a headphone jack splitter and a spare pare of kids headphones so they can listen along with an adult. Gus wasn’t super into it, but it did help extend the visit longer than if we didn’t have that option. We spent another day in South Kensington at the Natural History Museum and Science Museum. Both of these museums were AMAZING! And they are both free! Actually, most museums in London are free, which we loved. There was less pressure to see and do everything, and no guilt for wasting money if we left early. It also meant that we could go whenever we wanted to with the kids, instead of having timed tickets or rushing to get there at a certain time. Gus loved the dinosaurs, the earthquake exhibit, and we all had fun in the children’s area of the science museum! I would highly recommend both of these museums for kids AND adults! The architecture inside the main hall of the Natural History Museum is stunning! We were in London just as all the festive Christmas decor was going up – I wanted to go ice skating so badly! I’ll be honest – getting around London with two small kids and a stroller is NOT easy or for the faint of heart. Unlike the wonderfully accessible Metro and TMB system in Barcelona, the London Underground stations were mostly built over 100 years ago and most are not accessible. Lifts (elevators) are rare, and entryways/doors are narrow. It’s just not very stroller or kid friendly at all. We found that taking the bus was FAR easier, more interesting for Gus (who doesn’t want to ride on a double decker bus, right? ), we got to see more of the city that way, though the one downfall was that we had some frustrating experiences with traffic and late buses. We also got lost once! But it wouldn’t be an adventure without at least one mishap, lol! We spent one day at the London Transportation Museum and had a BLAST! What was so great about this museum is that it was totally made for kids. Gus was able to explore trains and buses, and Soren could easily get around as desired. They had a cute little play area for babies as well! Soren was 11 months old when we went, and it was perfect for him! Our whirlwind tour of London wouldn’t be complete without the Thames. We greatly enjoyed viewing the Tower Bridge, walking past Tower of London, the London Eye, and other landmarks. Probably the one thing I wish we could have done but didn’t have time for was a visit to Tower of London. It came highly recommended from many people, but I was concerned about getting around with a not-quite-yet-walking 11 month old. 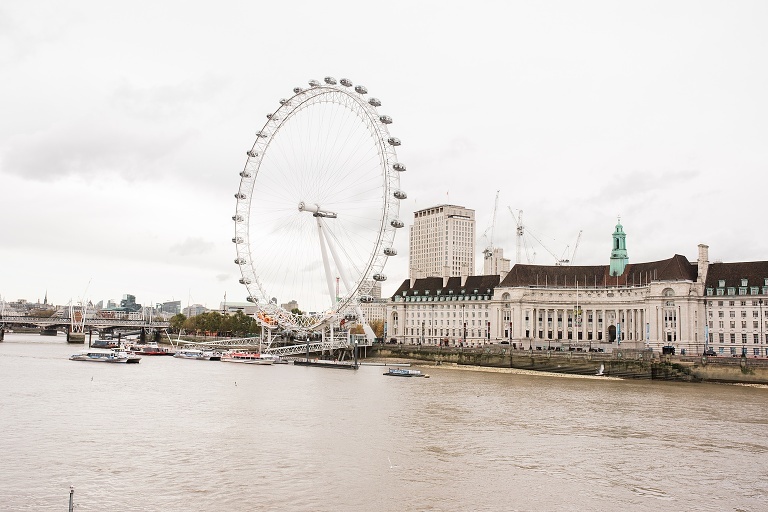 If we’re fortunate enough to visit London again, we’ll make sure to put that at the top of our list! We didn’t do many art museums because we knew the attention span for Gus was limited, and we wanted the trip to be just as fun for him as it was for us. Between the London Transportation Museum, the Natural History Museum, and the Science Museum, he was THRILLED…and we were exhausted! Lol! We probably could have squeezed in a brief trip to the Tate Modern or British Museum, but with tired legs and hungry tummies calling, most of our evenings were spent comfortably relaxing at our apartment and enjoying delicious local foods (we loved everything we ate!) I hope we can visit London again someday! « Family Portraits are BACK!